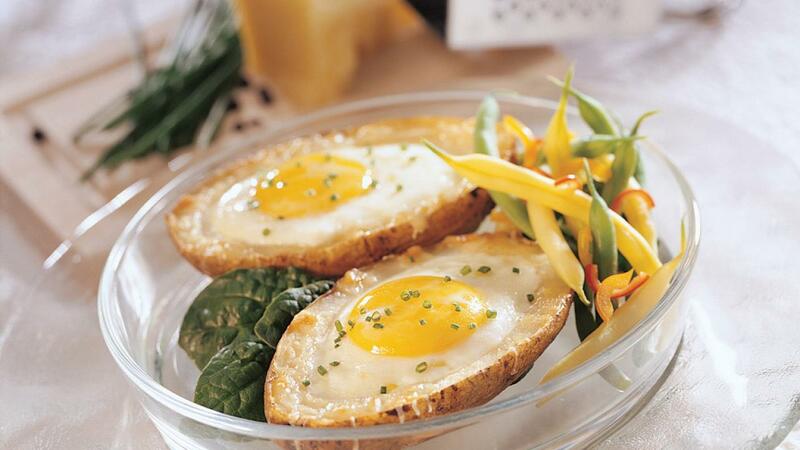 Add some protein to your baked potatoes with eggs in a spud. Tasty baked potato halves cradle soft boiled eggs topped with shredded cheese. Get even the fussiest eaters fed with this quick and easy dinner recipe. Cut hot potatoes in half lengthwise. Scoop out about half of the pulp from each potato half. Reserve potato flesh for another use. If necessary, remove thin slice from bottom of potatoes to stabilize. Set potato shells in shallow baking dish. Sprinkle each cavity with pepper and 1 tbsp (15 mL) cheese. Carefully break an egg into each potato shell. Bake in preheated 350°F (180°C) oven until eggs are cooked as desired, about 20 minutes. Sprinkle with parsley over top, if desired. Serve immediately. Russet or Idaho potatoes are ideal for baking. For this recipe, do not wrap potatoes in foil before baking in the oven. It steams them, making the skin soft and the centre moist and dense.